Some travelers rate airport food only a small step above in-flight airline food. Manchester-Boston Regional Airport (MHT) in New Hampshire is doing its best to change that perception by upgrading its main sit-down restaurant. The Local @MHT, which opened in March 2014, serves regional specialties created with fresh ingredients from local farms and suppliers. It also features beers from several area breweries. The new restaurant/bar concept posted sales of nearly $5 million in 2014, and revenue projections are even higher for this year. "[The Local] gives passengers a chance to get a true taste of what this region has to offer," says Airport Director Mark Brewer. "Every element of the restaurant, from the menu to the décor, is focused on celebrating New Hampshire and the surrounding areas." House specialties include Maine Lobster Roll, Fish & Chips, and Dirty Mac-n-Cheese (braised beef brisket is what makes it dirty). The bar features regional beers such as New Hampshire's own Red Hook and Smuttynose; Magic Hat from Vermont; Maine's Shipyard; and Samuel Adams, which is brewed in Massachusetts. Although MHT is located in New Hampshire, the airport is only 50 miles north of Boston. The combination restaurant/bar is beyond all TSA security checkpoints, centrally located within a five-minute walk from all of MHT's gates. The terminal concourse serves four major airlines: Southwest, USAirways/American, Delta and United. Last year, 2.1 million passengers traveled through MHT. According to airport figures, about 300 people frequent The Local per day, and another 100 guests visit the affiliated Local Rustic Market - a kiosk that offers carryout versions of some items served at the restaurant. 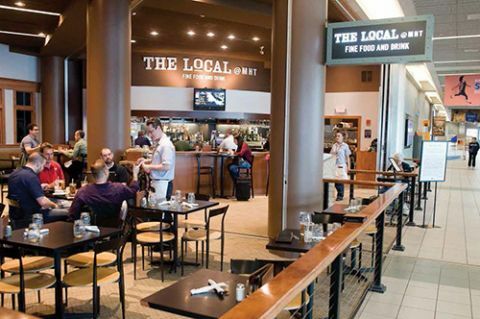 The Local @MHT occupies the footprint of the airport's former main eatery, Milltowne Grille. Designers used an earthy New England color palette for the new restaurant's paint and finish materials; its décor features photos and posters that highlight local scenery and sites. Seating includes 40 tables and 10 bar stools. The Local is managed by HMSHost, which runs restaurants in 114 airports around the world, including the 20 busiest in North America. The company developed the concept for The Local, staffs its bar and restaurant, manages daily operations and buys all ingredients, products and supplies. As the establishment's name suggests, using local suppliers has been key. Three people from the HMSHost's nationwide procurement staff purchase supplies and ingredients, and Executive Chef Patrick Malone works closely with the firm's supply chain to ensure the quality and sustainability of local suppliers, explains Tyler Pitman, the company's director of restaurant development. "Whenever possible, we use local suppliers to supply the ingredients we need for our regional menu," says Pitman. "In winter, it is a challenge to obtain locally grown produce, so we source ingredients from the Southeast, if necessary." Some items are purchased from wholesalers to lower costs and ensure fair value pricing, he adds. In 2014, The Local generated nearly $5 million in revenue, with receipts split roughly evenly between the food and drinks. "We consider this fine for an airport the size of MHT," Pitman says. "I am optimistic our revenue will continue to grow in 2015, once frequent travelers become more familiar with The Local @MHT and what it offers." According to Brewer, the airport's business arrangement with HMSHost has worked well for both parties. "Under our agreement, HMSHost pays us a percentage of gross sales, on a graduated scale. Therefore, their success is our success," he explains. The airport serves slightly more leisure travelers than business fliers (53% pleasure; 47% business); but both segments seem to be embracing The Local as a destination restaurant. Many rank it equal to or better than other restaurants near the airport, reports Brewer. "Most guests are delighted and amazed by the quality and variety of the menu, combined with the hometown Granite State hospitality of the staff," he remarks. "More customers seem to be arriving at the airport earlier than they normally would, so they can visit the restaurant before departing." According to Pitman, fully 85% of the restaurant's business comes from departing passengers. "People returning to Manchester from a trip usually just want to get home," he theorizes. Riding the current industry trend of concession concepts that highlight local ingredients and food/beverage brands, HMSHost also manages a regionally focused restaurant in Terminal 1 of New York's John F. Kennedy International Airport. Later this summer, it plans to open a similar concept at Albany International, also in New York.